Aromatic spices of cooking curry tickles my nose; a pleasant Thai melody fills my ears with ambient noise. Taken on a journey across the years by the familiar atmosphere, I rest assured that Ning’s Thai Cuisine will give me a delicious dinner that will make my taste buds tingle. My table orders a slew of different curries: green, red and pineapple. 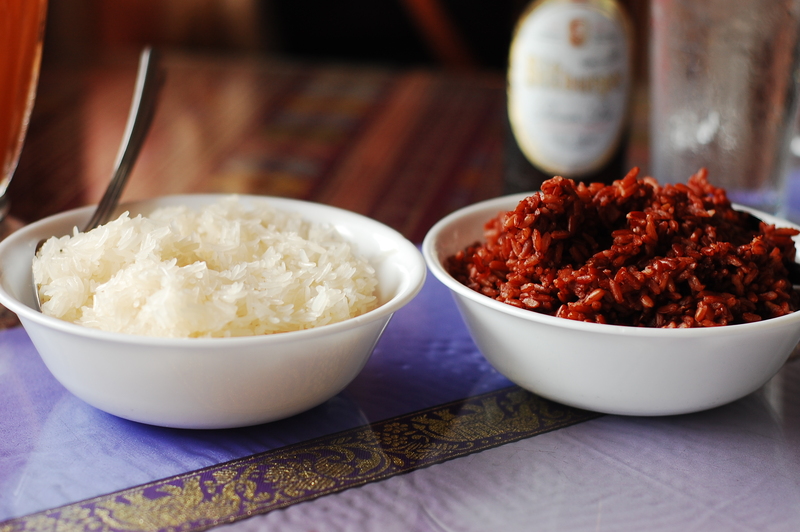 We also order both sticky rice and brown rice. A real likeable aspect of Ning’s is being able to try many different dishes; everyone receives separate plates. The pillow of rice goes onto the plate, followed by a heaping of vegetable-filled curry. The sauce absorbs into the rice like a sponge, but the rice remains just right, with a certain amount of softness and chew. The smooth coconut milk in the sauce marriages perfectly with the blend of spices. If there is one thing you learn from reading this article, it is to not pass up the curries if you visit Pahoa town. To do so would be a crime ending in non-delicious demise. The curries are the highlight of the menu. Don’t forget to order a Thai Iced Tea, which is described by the menu as “a sweet and creamy orange tint drink.” The blaringly orange beverage is a thick, sweetened black tea topped with coconut milk or cream. Star anise, crushed tamarind and cardamom are occasionally added to Thai iced tea, according to Arborteas.com. Ning’s Thai Cuisine is a choice dining spot for locals, and tourists who drop by aren’t quick to forget their experience. s and in Kona, but one thing I can say certainly is that Ning’s surpassed all of them,” says Austin Cole, a visiting University of Minnesota Twin Cities student. “If you’re taking someone on a date, [the prices] are all good,” adds Cole. Not counting desserts or beverages, the menu consists of 45 different dishes: appetizers, soups, curries, entrées, seafood, rice and noodles. Ning’s has it all: sweet or savory, mild, medium or hot. And, believe it or not, nothing costs more than $13.95 on their printed menu. There are so many options, but they all share the same outcome: tasty food and pure satisfaction. Come in before 4:30 p.m. to partake in the super lunch deal: one of three entrées and a choice of rice for $8.95 with tofu, chicken, beef, or pork; or $10.95 for shrimp, scallops, or squid. The deal entrées change daily. The dinner deals aren’t too bad either: $14.95 for an entrée with rice. Pumpkin curry makes a cameo appearance from time to time on the specials menu, though not listed on the print menu. Curious foodies can try this delightfully creamy dish at the Maku’u Farmer’s Market, where Ning’s sells several varieties of curry on Sunday mornings. A Yelp.com webpage is the closest Ning’s Thai Cuisine has to an official website, where they have a neat four and a half stars based off of 37 reviews. It’s definitely an ode to the exceptional food served at the restaurant. As the day dims to night, the strand of festive, albeit unseasonal, Christmas bulbs flicker punctuated every few feet by a dead bulb, and I think to myself in a state of taste-induced bliss: Yep, it’s just as good as I remember it. 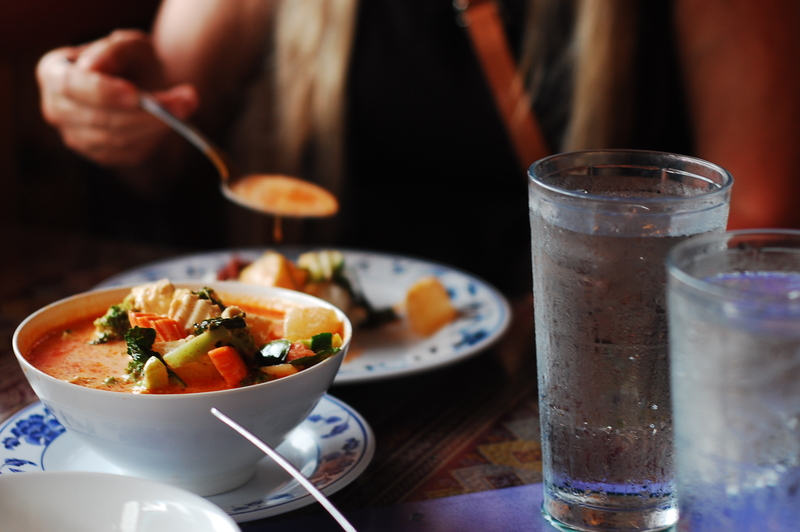 Ning’s Thai Cuisine is open Monday through Saturday 12pm to 9pm and Sundays 5pm to 9pm. This is volume 2 in the Pahoa digs series. Interested in reading the previous installments? Pay a visit to kaleo.org or harleydiven.wordpress.com for the full series.